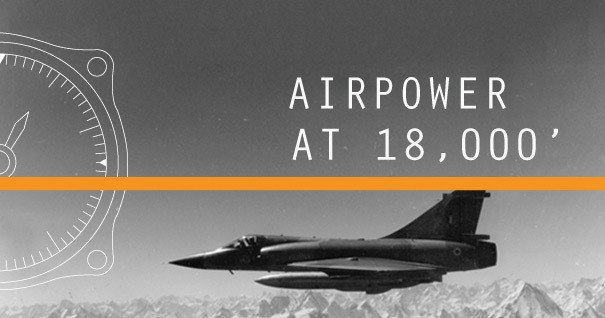 The Kargil conflict offers an exemplary case study in the uses of airpower in joint warfare in high mountain conditions and is key to a full understanding of India’s emerging air posture. In the spring of 1999, the world slowly became aware of Pakistan’s foray into the Kargil-Dras sector of the disputed state of Jammu and Kashmir, a provocation that would incite the limited war now known as the “Kargil conflict.” This clash represented a watershed in Indo-Pakistani security relations because it demonstrated that even the presence of nuclear weapons might not dampen the competition that has persisted historically between the region’s largest states. But the conflict distinguished itself in other ways as well, especially in the scale and type of military operations. Although past struggles for advantage along the disputed borders outside of declared wars invariably involved small infantry elements on both sides, the Kargil conflict was unique both in the number of major Indian land formations committed to the struggle and New Delhi’s decision to employ airpower. The role of airpower, however, was tinged with controversy from the very beginning. Both during and immediately after the conflict, it was not clear whether the Indian Air Force (IAF) leadership of the time advocated the commitment of Indian airpower and under what conditions, how the IAF actually performed at the operational level and with what effects, and whether the employment of airpower was satisfactorily coordinated with the Indian Army at either the strategic or the tactical levels of war. Whether airpower proved to be the decisive linchpin that hastened the successful conclusion of the conflict was also uncertain—but all these questions provided grist for considerable disputation in the aftermath of the war. What the Kargil conflict demonstrated, however, was that airpower was relevant and could be potentially very effective even in the utterly demanding context of mountain warfare at high altitudes. At a time when India is compelled to think seriously about the security challenges posed by China’s continuing military modernization—especially as it affects India’s ability to protect its equities along the formidable Himalayan borderlands—a critical assessment of the IAF’s contributions to the Kargil conflict is essential and in fact long overdue. Various partial analyses have appeared already; they are indispensable because they address several specific dimensions of IAF operations ranging from the early debates about strategy and the political impact of employing airpower to overcoming the various difficulties that the IAF had to surmount in quick order if its instruments of combat were to make a useful contribution to the success of India’s national aims. The combat capabilities brought to bear in the airspace above the mountain battlefields, obviously, constituted only the visible tip of the spear; a vast and often invisible system of organization and support involving everything from managing intratheater airlift to redeploying combat squadrons to planning and coordinating operations to improvising technical fixes amidst the pressure of combat were all implicated in airpower’s contribution to the Kargil War. This story has never been told before in depth or with comprehensiveness and balance—yet it deserves telling both because it sheds light on an important episode in Indian military history and because its lessons have implications for managing the more demanding threats that India is confronted with in the Himalayas. This monograph by Benjamin Lambeth advances both aims admirably. It represents a serious scholarly effort to understand how the IAF actually performed at Kargil and is exemplary for the meticulousness of its research, the political detachment of its analysis, and its insights which could come only from one of America’s premier analysts of airpower, who also happens to have accumulated extensive flight experience in more than three dozen different types of combat aircraft worldwide since 1976. Lambeth’s oeuvre—manifested during a distinguished career of over forty years (most of it at RAND)—has always been wideranging: in addition to his many writings on airpower and air warfare, it has included seminal studies on Soviet military thought; nuclear deterrence, strategy and operations; geopolitics in the superpower competition; and the evolution of military technology and its impact on warfighting. Given his diverse interests and his formal academic training at Georgetown and Harvard, it is not surprising that Lambeth’s study ranges across multiple levels of analysis, from the geopolitical to the tactical. This broad approach permits him to cover airpower’s contribution to the conflict in extraordinary detail. It relies not simply on the published record but also on detailed interviews with the IAF’s leadership and its combat cadres as well as on extensive communications with a host of participants from the other services involved in the war, all brought together in a seamless and coherent analytical narrative. As the result, the report is simultaneously a chronicle of what the IAF actually did and a fair evaluation of both its achievements and its shortcomings. National security analysts in the United States and in India, as well as policymakers in both countries, would do well to read the monograph carefully because of its judgments about IAF capabilities and the paths implicitly suggested for future U.S.-Indian defense (and in particular airpower) cooperation. The South Asia program of the Carnegie Endowment for International Peace is privileged to publish Lambeth’s report. I am especially grateful to the Indian Council for Cultural Relations for supporting the Endowment’s ongoing research on Indian security.